Whether amateur or pro, guitarists live for the ultimate sound. 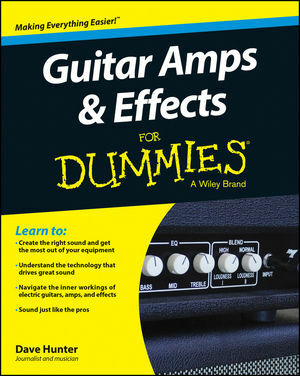 Guitar Amps & Effects For Dummies provides the information and instruction you need to discover that sound and make it your own! Written in the characteristically easy-to-read Dummies style, this book is ideal for beginners and experienced musicians alike, and can help all players expand their skill set with effects. Guitarists tend to be gearheads when it comes to sound, and this book provides guidance on topics ranging from the guitar itself to amps, pedals, and other sound technology. The journey to incredible guitar music never ends. No matter how experienced you are with a guitar, there is always room for improvement to your tone and sound. Whether you're looking for the sound of angels or thunder, Guitar Amps & Effects For Dummies will help you achieve the music you hear in your dreams. Dave Hunter has made a career out of explaining the relationships between guitars and amp tone, and the technology that creates it. He has authored or coauthored dozens of books on guitar topics, columns in Guitar Player and Vintage Guitar magazines, and is considered a top authority on amps and effects.